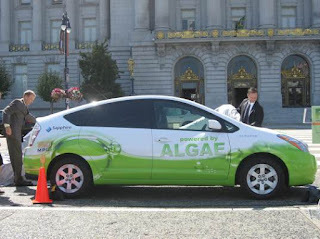 The Algaeus (pictured at right) is said to be the world's first fuel-powered vehicle running on algae. The other notable components of the Algaeus are a nickel metal hydride battery and an electrical plug. There are no other modifications made to its gasoline engine. It's currently attempting to cross the United States from coast to coast... on just 25 gallons of fuel!